that help sustain unjust political, economic, and other societal structures. This page lists my critical psychology work. Links to other sites and resources are at the bottom. 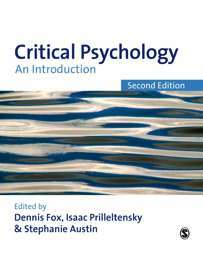 How can I study critical psychology? "The arrival of a second edition of this classic is an exciting event. The editors have assembled a world class array of authors to bring students to the forefront of critical scholarship today. Adding to the work's luster are fresh new chapters on critical social issues, along with a set of new pedagogical aids. Bravo!" "An excellent book in all respects - compulsory reading for scholars interested in a socio-political contextual analysis of complex human behaviour." "It provides a comprehensible and on the whole accessible introduction to the area and therefore is a volume that is to be recommended for third-year undergraduates- but not just before finals, as it will certainly challenge many of their beliefs and values and could confuse them no end." First edition also published in Greek and Indonesian! My critiques of mainstream psychology's norms, organized psychology's political stances, and more. In some cases critical psychology is tangential to the main point. My other academic papers listed elsewhere are even further removed. 2013. Changing Ourselves while Changing Society. Interview in Pokret za Slobodu (Serbian Freedom Fight Movement). 2012. Critical Psychology and Social Struggles. Interview in Meydan, Turkish anarchist magazine. 2011. Anarchism and Psychology. Theory in Action. 2011. Competing Narratives about Competing Narratives: Psychology and Palestinian-Israeli Conflict. 2011. Critical and Radical Psychology. Entry in Encyclopedia of Peace Psychology. 2010. Critical Psychology, Capitalism, and Transformation. Panel discussion, German Critical Psychology Conference, Free University of Berlin. 2010. Critical Psychology in the United States and Canada. German Critical Psychology Conference, Free University of Berlin. 2001. Challenging Basic Assumptions: The (Potential) Value of Social Science Education. 1995. Can the Radical Psychology Network's Critique Make SPSSI More Resilient? 1985. Psychology, Ideology, Utopia, and the Commons. ...incorporate critical perspectives on psychology as well as on law and society. The Radical Psychology Network, which I co-founded, is an international organization of radical/critical psychologists and others. The website includes position papers, policy statements, and more. We also have an e-mail discussion list. Materials on the RadPsyNet site include syllabi, reading lists, etc. General information and advice about studying critical psychology. Only a few graduate programs open to one form or another of critical psychology are listed here. The UK Discourse Unit has a longer list of options around the world. If you're looking for undergraduate departments, start by looking at schools with related grad programs. Vanderbilt University's Peabody College has a PhD program in Community Research and Action. This is no longer strictly a community psychology program. Duquesne Univerity has a PhD program in clinical psychology: "human science psychology emphasizes qualitative research that explores questions regarding meaning, values, experience, and culture. Similarly, in the field of clinical psychology, human science psychologists incorporate this perspective and its research findings into the practice of psychotherapy." Its undergraduate BA degree also emphasizes psychology conceived as a human science. University of California-Santa Cruz says its social psychology PhD program focuses on social justice. University of West Georgia's PhD. in Consciousness and Society includes three theoretical approaches: Critical, Humanistic & Transpersonal. University of Tennessee Center for Applied Phenomenological Research. Critical Psychology in a Changing World - Annual Review of Critical Psychology, Volume 10, 2013 - 49 articles on critical psychology around the world! Initiative Critical Psychology (Vienna) - "Forum for the Critical Analysis of Psychology, Dominace, Patriarchy, Ideology . . ."
Google Search for "critical psychology"